EVANSVILLE, Ind. – Several churches in southwestern Indiana had been planning to display a collection of artistic crosses in the middle of their town, but a lawsuit from the American Civil Liberties Union (ACLU) has now put that plan in jeopardy. West Side Christian Church (WSCC) in Evansville recently announced plans for the first annual “Cross the River” campaign, scheduled for August 4–18. By collaborating with several community churches, WSCC members were hoping the project would raise funds for the Evansville Rescue Missions Camp Reveal and Childcare Assistance Resources of Evansville. Last month, the Evansville Board of Public Works discussed in detail the proposed cross display during a board meeting. Meeting minutes obtained by Evansville Courier & Press document the lengthy discussion board members had with Mike Day, a contractor who is planning to supply the crosses for the display. During the meeting, Day explained that the monuments will be “a show of faith” for the over 200 churches in the greater Evansville area. 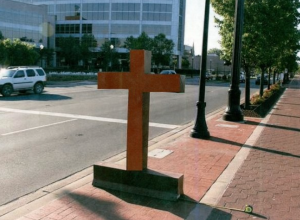 In addition, the city’s Corporate Counsel Ted Ziemer affirmed that the crosses would not violate any laws. Two weeks later, the Evansville board again discussed the cross display proposition. According to minutes from the meeting, WSCC’s Roger Lehman answered questions from board members about the Cross the River campaign, and also pointed out that the crosses would probably draw people to the city’s downtown area. Following the meeting, members of the board unanimously voted to grant the churches permission to display their six-foot-tall crosses in August. However, the ACLU—a church-state separatist group—filed a lawsuit five days after the meeting, arguing that the Cross the River project violates the First Amendment of the U.S. Constitution. In the meantime, Alliance Defending Freedom (ADF)—a non-profit religious freedom advocacy group—announced on Tuesday that they have filed a motion to intervene in the ACLU lawsuit and protect the churches’ liberties. ADF says ACLU lawyers are “seeking to enjoin and destroy” the Evansville churches’ efforts. ADF attorney Bryan Beauman said in a press release that the churches’ basic freedoms are being threatened by the ACLU.